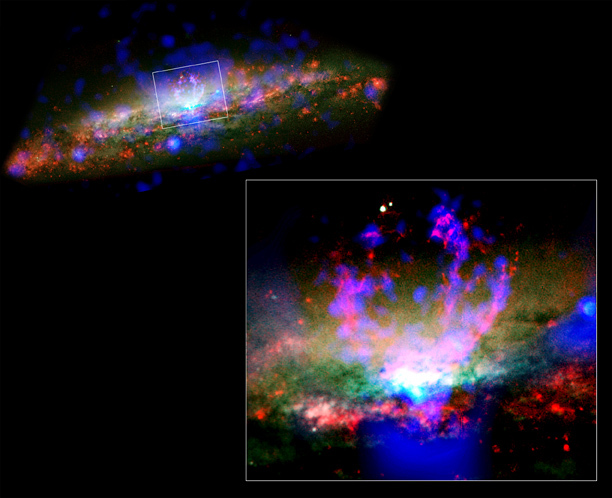 Chandra's X-ray image (blue) has been combined with Hubble's optical image (red and green) to compose this stunning and revealing picture of the spiral galaxy NGC 3079. Towering filaments consisting of warm (about ten thousand degrees Celsius) and hot (about ten million degrees Celsius) gas blend to create the bright horseshoe-shaped feature near the center. The correlation of the warm and hot filaments suggests that they were both formed as a superwind of gas -- rushing out from the central regions of the galaxy -- carved a cavity in the cool gas of disk galactic disk. The superwind stripped fragments of gas off the walls of the cavity, stretched them into long filaments, and heated them. The full extent of the superwind shows up as a fainter conical cloud of X-ray emission surrounding the filaments. A superwind, such as the one in NGC 3079 originates in the center of the galaxy, either from activity generated by a central supermassive black hole, or by a burst of supernova activity. Superwinds are thought to play a key role in the evolution of galaxies by regulating the formation of new stars, and by dispersing heavy elements to the outer parts of the galaxy and beyond. These latest Chandra data indicate that astronomers may be seriously underestimating the mass lost in superwinds and therefore their influence within and around the host galaxy. Coordinates (J2000) RA 10h 01m 57.80s | Dec +55° 40´ 47.10"